This is an expandable, athletic, colorful show that is culturally correct while still being highly entertaining. Crafted around the most recognizable and requested Tribal dance. 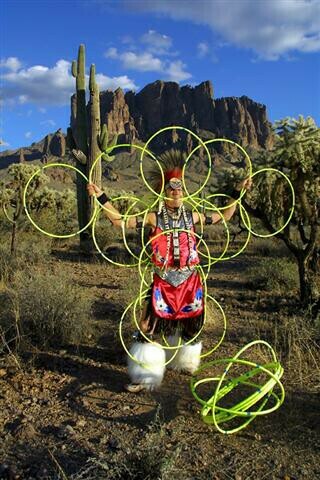 The artist, a nationally ranked Hoop Dancer, will entertainingly explain the significance of the hoops, and the forms created with them. These include the Butterfly, Mother Earth, the Flower, the Taos Ladder, the Scorpion, and more. The exciting exhibition that follows will leave guests with an unforgettable image of this great southwestern Native art form. This is a somewhat short presentation (12 – 15 minutes), perfect for an after-dinner presentation, a finale for a reception, or opening of a general session.